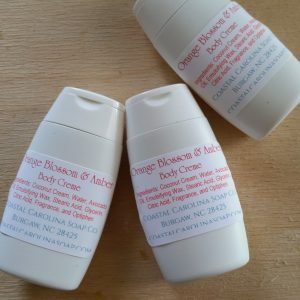 It is not at all unusual for me to get special orders for products or for people to tell me about their skin conditions and ask me to pair them up with products that will meet their needs. Usually, for complaints of psoriasis, eczema or sensitivities to fragrances, I recommend Soap of Milk & Honey (and Oatmeal!). I received a call, though, from a long-time customer who was looking for products similar to what she had been getting from another company. That’s not something I usually like to do, but she gave me the name of the company and the products, so I started investigating. Imagine my surprise when I discovered these products which were earth-inspired and “natural” were made of premade bases with a few things added! They even made claims about the healing properties about an ingredient that was in a product’s name, and the only hint of that ingredient was the scent! For bathing, I’m hooking her up with gloriously luscious body wash. This mild soap made of a blend of premium, skin-loving oils builds lots of fluffy lather and leaves skin scrumptiously silky and richly supple. The fragrance is an intriguing blend of herbaceous lavender and juicy pink grapefruit. To hit those troubled dry spots, the lotion is a creamy blend features coconut milk and contains avocado oil, a great addition for her slightly more mature skin. This also has that same incredible scent as the soap, so she’ll get to enjoy the light scent without inflicting it on everyone around her.